The National Society of the Sons of the American Revolution (SAR) will be moving their national headquarters from Old Louisville to the Museum District of West Main Street downtown. The organization will also be building a history museum and genealogical library dubbed The Center for Advancing America’s Heritage at their new facility near the corner of Main Street and 8th Street. The SAR is currently located at the corner of Fourth Street and Kentucky Street in Old Louisville and owns a good amount of property on adjacent blocks there that a previous museum and headquarters was proposed for years ago (see photos below). 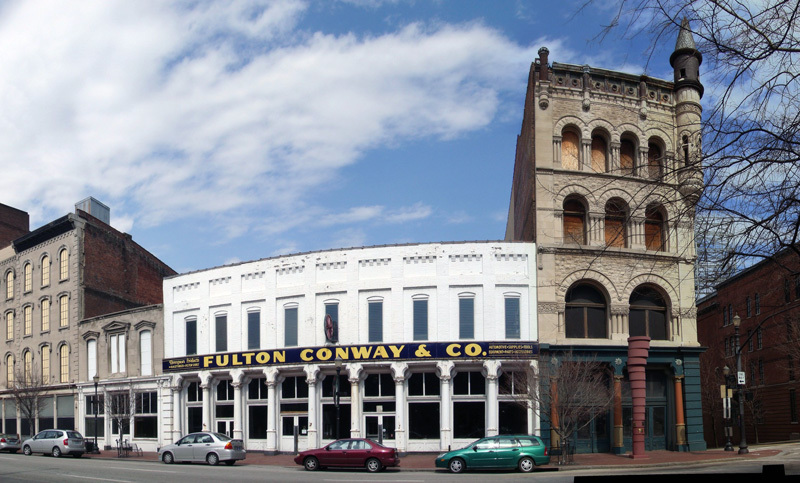 The organization began looking downtown for expansion to be part of the cultural center of West Main Street and initially proposed to purchase the six-story, red-brick Kentucky Opera Building on the south-east corner of 8th Street and Main Street. Early this year, the search expanded across the street to the 1860s-era Fulton Conway Building that offered better amenities for the overall project including on-site parking and archival space in the basement. The asking price was also cheaper at under $2 million, allowing for quicker commencement of construction. The new location and design adjacent to the Frasier Historical Museum looks much better for everyone involved and should compliment the assortment of cultural establishments already in the area. The National Society of the Sons of the American Revolution is a patriotic organization formed in 1889 and chartered by the United States Congress in 1906. SAR has more than 27,000 members living in all of the 50 states and 23 foreign countries. The SAR National Headquarters in Louisville, Kentucky, is more properly a historic shrine honoring our Patriot Ancestors. It is a museum of art and artifacts from the colonial and revolutionary periods, and a genealogical library. The museum includes an extensive collection of historical American paintings and an exact replica of the Liberty Bell. Construction on the project should begin when a fundraising campaign currently underway raises $6 million. Historic tax credits are also currently being sought to help pay for the project. After the new museum and headquarters is finished, the old location will be sold and funds added to an endowment for the organization. With the fundraising well under way, hopefully we might see activity at the site sometime next year. Already, banners, logos, and renderings announcing the project have been posted on the Fulton Conway Building. Overall, this will be a great project to anchor the Museum District and build a cultural critical mass unrivaled in the state or in many places throughout the country. An interesting note about the Fulton Conway Building: the structure is noticeably shorter than its neighbors, but appears aesthetically similar to the turreted Fort Nelson Building next-door. In fact, the structure was once four-stories and similar in height to other Main Street buildings. The great tornado of 1890 (a monument for the tornado stands on the corner of the block) ripped through Main Street and collapsed the upper floors which were never rebuilt. At least we still have the original cast-iron facade along the sidewalk. I love your website. I mean, I really really love it! Such great work! I check it multiple times a day and look forward to the updates. Keep it up!